Our object this week comes from our Father Thomas Carroll Collection. Robert "Bob" Amendola (1909-1996) was an artist working as an engineering illustrator at an aircraft plant in the 1940s when he was “borrowed” by Father Carroll to help blinded veterans develop their sense of spatial awareness. After the war, Amendola joined Carroll at the Catholic Guild for the Blind in Boston and developed a course of spatial orientation and sound localization that he called "videation." His work impacted thousands of trainees over four decades. 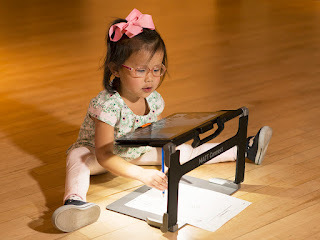 According to the Carroll Center website, "Amendola continued his work as an artist... completing many commissioned sculptures, notably the Stations of the Cross in the Chapel of St. Thomas Moore at Yale University and the statue of George Washington Carver as a boy at his Diamond, Missouri birthplace, now a national monument." 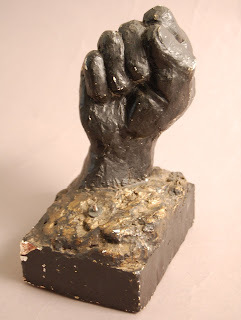 This clenched fist is a plaster casting, painted dark bronze.